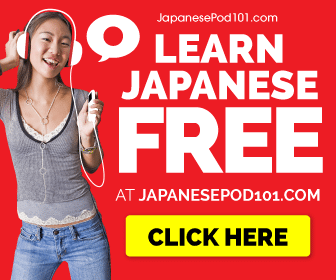 The Ainu People of Japan Revealed – Who Are They? I originally started writing this because I did a post on Hokkaido, and it’s hard to mention Hokkaido if you do not bring up the Ainu people and their culture, as most of Hokkaido has been shaped by these people and their past. This is a new video below as the old one was deleted, it’s quicker and to the point. But do take a gander at the article to fill in any gaps the video may miss. 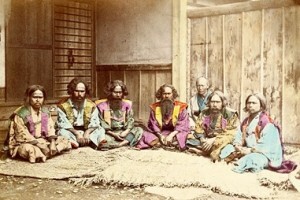 The Ainu (which means ‘human’) or also called the Aynu, Ezo, Emishi and Ebisu are indigenous people of Hokkaido, Japan. They are also said to be from the Kuril Islands, Sakhalin and Russia as well as the very northern area of Honshu which is mostly Aomori, Japan. 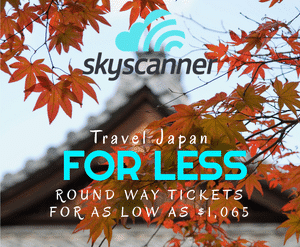 It’s said that there is only around 25,000 of these people left in Japan and in Russia. But some say there could be up to 175,000. 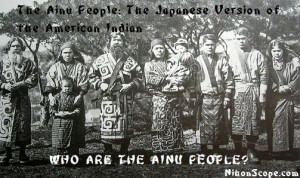 But no matter the number, there is only around 2-10 native speaking Ainu’s left in the world! These people could very well be described as the Japanese version of an American Indian. They prayed to nature, felt that all things in nature had a spirit or god within it. From animals to plants to even objects, they felt all things had a basic energy amongst it that made it special. So the word Ainu is in opposition to these gods in their religion. Hokkaido was originally called Ezo by the native Ainu, and in 1869 1 year after the Meiji period began, the new government changed the name as Japan incorporated Hokkaido as a Japanese controlled land mass. 30 years later the Japanese government passed a law/act that labeled these Ainu peoples as ‘former aborigines’ which immediately made them legal Japanese citizens, and further denied them the status of claiming that they are indigenous. 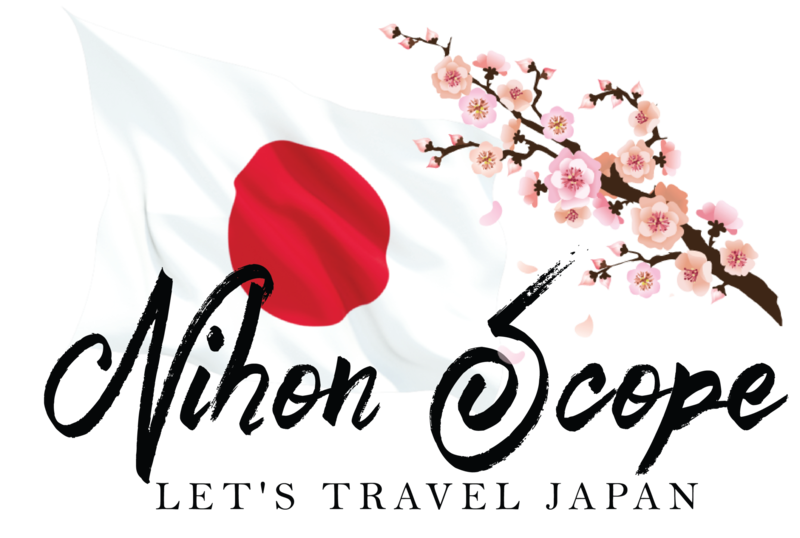 Once this happened their lands of Hokkaido were then distributed to the Wajin which literally means ‘Wa people’, the Wajin are names given to the dominant native ethnic group of Japan, so immediately this brought about a racial discrimination into the culture, from those ‘original’ Japanese and the newly appointed Ainu. This push for reclamation of the Ainu lands was to said to accomplish a few different challenges that the Japanese government wanted to settle. 1st they said it was a means to defend Japan from a quickly expanding Russia. 2nd it would fix the ever growing unemployment rates for the former samurai class. The Japanese government also took Hokkaido to help with natural resource gathering for their ever expanding capitalist economy. What ever the reasons were in the beginnings of the Japanese and Ainu’s relationship it’s been tough. Many revolts took place while the Japanese continued their attempt at controlling these native people and their way of life by trying to merge them into their culture and once they finally did in 1899 they were forced to learn Japanese and adopt Japanese customs, but before all this was ever to take place the revolts of the Ainu people were heard several times in Japanese history. 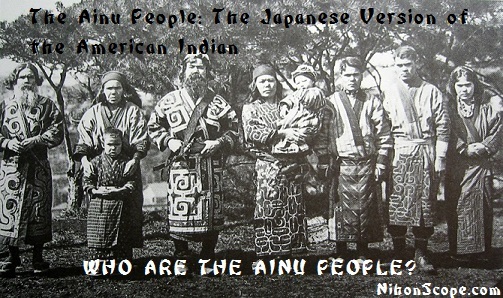 The origins of the Ainu people were said to have descend from the Jomon people who lived in Japan during the Jomon period (14,500 to 300 BC). So it’s fair to say that through legend and historical data these Ainu people lived in and amongst the Japanese country for tens of thousands of years before the children of the Sun ever arrived.